Image caption The number of empty homes has fallen for the first time in three years. 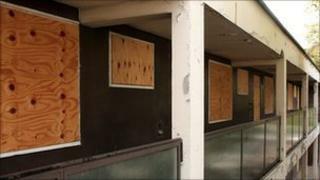 The number of homes in England empty for more than six months has fallen to 296,000. The Halifax, which compiled the figures, said the number had dropped by 6%, or 21,000, in the year to April 2010. This was the first time in three years that the number of long-term empty properties had fallen. The Halifax said most, 61%, were in the north of England, usually in deprived areas with high unemployment. "It is encouraging that the number of long-term empty private homes has fallen, reversing the increases recorded over the preceding two years," said Suren Thiru of the Halifax. "Nonetheless, it is concerning that the problem of empty homes remains substantial in a number of areas," he said. The North West of England alone had 22% of all English long-term voids. They accounted for 2.6% of all privately owned properties in that region, compared to an average void rate of 1.6% for the whole of England. The biggest fall in the number of long-term empty homes was in Yorkshire and Humberside, down by 22% in the last financial year. However, the biggest increase in long-term empties was in the South West, where they rose by 10%. Although void rates were highest in the north, the London borough of Tower Hamlets had a greater proportion than any other local area in England at 3,700, or 6.5% of all privately owned properties. The Halifax said empty homes were not just those waiting for a tenant, but those being modernised or empty because they were in poor state or about to be demolished.